That car, much like its Lincoln counterpart at the time, was enormous. Especially to a 6 year-old child. The backseat was large enough for an entire battle between Army men and Transformers without ever disturbing the person to your right or left. 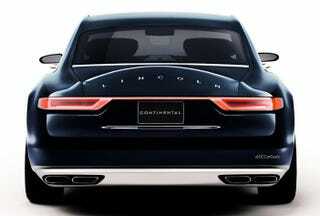 The car also had a very distinguishing, almost attractive, rear end. While the Cougar had a boxed shaped trunk-bump the Continental Mark V had a more curved piece of metal. It was beautiful. This was the impetus for the 'shop above. Maybe I'm crazy for thinking this but I can't help but feel like Lincoln missed an opportunity to bring back that protruding shaped trunk. The more I look at this the more I think - it actually works.